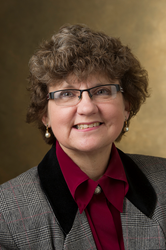 Southern Illinois University Edwardsville’s Terri Poirier is the lead author on a proposal that has received the American Association of Colleges of Pharmacy (AACP) Award for Excellence in PharmD Program-Level Assessment. Terri Poirier, professor of pharmacy practice in the SIUE School of Pharmacy. Southern Illinois University Edwardsville’s Terri Poirier, PharmD, senior scholar and professor of pharmacy practice in the School of Pharmacy (SOP), is the lead author on a proposal that has received the American Association of Colleges of Pharmacy (AACP) Award for Excellence in PharmD Program-Level Assessment. The award recognizes outstanding doctor of pharmacy assessment programs for their progress in developing and applying evidence of outcomes as part of the on-going evaluation and improvement of pharmacy professional education. Program-level assessment is the systematic collection, review and use of information about PharmD programs undertaken for the purpose of improving student learning and/or the program and its affiliated elements. “Congratulations to Dr. Poirier and team, including the collaborators from the Schools of Nursing and Dental Medicine, for designing and assessing this innovative interprofessional programmatic project,” said Gireesh Gupchup, dean of the SIUE SOP. Because error disclosure training was identified as a top priority for interprofessional education (IPE), their goal was to conduct a prospective evaluation of an error disclosure assessment tool along with video review to enhance student learning and metacognitive skills, while assessing the Interprofessional Education Collaborative (IPEC) competencies. Their results demonstrated that use of video recordings made a significant difference in student self-assessment for communication and processing categories of error disclosure. The use of assessment instruments and video recordings may have enhanced students’ metacognitive skills for assessing performance in interprofessional error disclosure. The process appeared to enhance learning about the skills needed for interprofessional error disclosure. Poirier will be recognized at the 2017 AACP Annual Meeting in Nashville July 15-19 and will present the project at a special session.